Here's a caricature of an old friend. How shall I label it? I'll try.. Even before the internet, the initials “www.” for us guys here in the Filipino-Australian community meant Wagga Wagga Wonder, period. Can’t argue. That was a period driven by rich, patriotic adrenalin. The boy with a golden voice comes from an Australian town so far away from Sydney, people refer to it as woop-woop (Australian for the middle of nowhere). 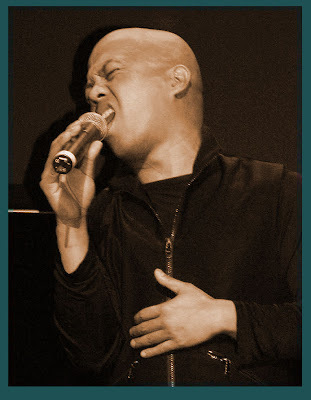 Jerson was television’s darling when he won Star Search in 1992, a singing competition to what is now Australian Idol. Wagga Wagga locals, including drovers, crowded it’s lone pub to see on television their local larrikin Jerson make waves in the Big Smoke. His mum is Filipina and has settled in step with his father in Wagga Wagga until he moved out to Sydney to pluck his oyster. He indulged. The following year Jerson became champion of the popular Bert Newton’s New Faces on Channel 10. Wagga Wagga was once again put on the map, topography of which included a proud Filipino Australian community. Soon boy wonder touched every microphone in Sydney’s night life. Session bands were desperate for him. 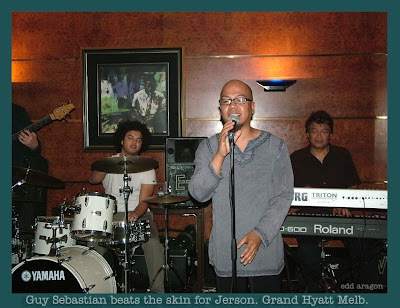 He also sung solo, most of the time performing with imported OPM (Original Pinoy Music) artists from Manila. He was overwhelmed by the kindness and generosity of friends who sometimes spoilt him. There’s a wild and romantic man in Jerson which he longed to release via cool and expressive genres like soul, jazz and funk - yet his heart remained aloof of gender stereotypes. Then Jerson disappeared from Sydney. Mental posters were pasted all over Fil-Aus community’s nocturnal metropolitan walls—Jerson Trinidad is missing! Was he kidnapped? 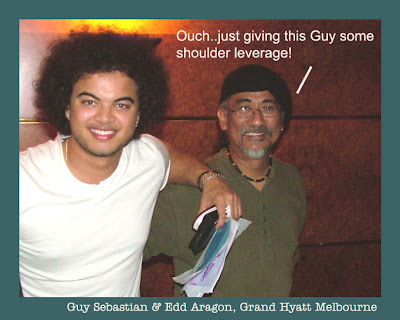 Grand Hyatt Melbourne won’t let go of Jerson - that I found out when we were there after attending a Filipino fiesta where I was commissioned to do promotional caricatures for a Pinoy global media company. Looking at my watch it was almost 1 a.m. and I thought drummer was tired when he rose up only to be replaced by a guest drummer who stormed in and made all our jaws drop. It’s the famous Guy Sebastian, the first Australian Idol! EA: So what are you up to now, Jers? EA: Wow astig! Is that for mainstream? JT: Of course Tito, it’s jazzy and a lot of funk style. EA: I can’t wait. How long has Hyatt held you err…“hostage”? JT: About 5 years now Tito and it hurts.. they don’t wanna let go of me! (giggles) although I’m beginning to like it here. EA: Oh Jerson, that’s called the Stockholm syndrome, just like in the movie Dog Day Afternoon where hostages sympathize with the kidnapper. Ha-ha-ha, I guess it works out okay for both parties. So what do you mean there’s change soon? JT: I’m off for Japan and will be there for 3 months. EA: Why? You’re not gonna burn all karaoke machines there are you? hotel can keep me hostage and if the ransom can’t be paid by the next bigger hotel then you know…good for me, ha-ha-ha! EA: I’m an ignorant and jealous Sydneysider, so what’s happening in your Hyatt Melbourne gigs? Jamie Cullum who was so gracious enough to get bored in his majestic room and came down to listen to me until he actually sang a song with us house band who are also Pinoys! EA: That’s terrific Jers, am proud of you and the Pinoy talent. Who are you listening to right now? 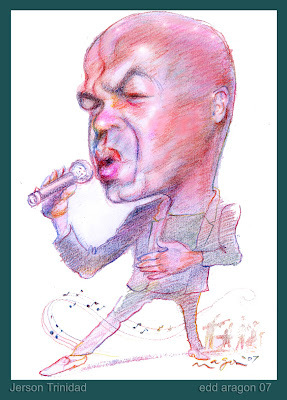 JT: Frank McKomb, great jazz singer. He inspires me a lot. EA: Who else inspires you Jers? JT: Still the great Al Jarreu and George Benson Tito Edd. And they will be staying at the Hyatt, too this month. That means they’ll also get bored in their luxurious rooms, come down and shall jam with me (giggles again). Cough-cough. EA: Hey Jerson, you’re smoking too much. Take care of your singing throat and leave some for me, hahaha! Seriously though, when are you coming back to Sydney? JT: I don’t know yet Tito, but I’d love to. 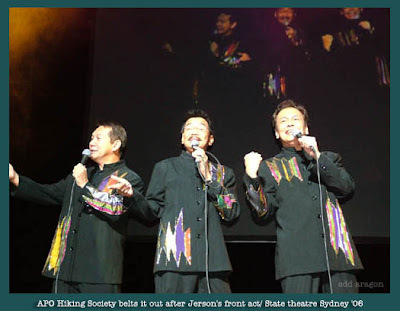 I was in Sydney last year front-acting for APO Hiking Society at the State theatre. There I saw again old friends. I was so teary-eyed, Tito, because they missed me so much! JT: Hahaha ay naku Tito mabait na po ako ngayon. (I’m a good boy now uncle. ); but I’ll have to move on. EA: Good luck to you Jerson. Does your mum still live in Wagga Wagga? JT: Forgot to tell you, we’ve moved away already Tito Edd. EA: Oh really? Whereabouts now? JT: I visit mum now at Warrnambool! EA: Huh? Now that’s even woop-woop-er! JT: Ha-ha-ha, they love it there, the couple would never trade the vast space of land and sky for city living. JT: Ha-ha-ha. That would be a cute title for a song! Thank you, too Tito Edd! By the way I love reading your blogs! A big hello to your readers! Salamat po sa inyong patuloy na pagtangkilik sa kakayahan ng mga Pilipino-Australyano (Thank you for continuously patronising the Filipino-Australian talent). Watch Jerson sing Stevie Wonder's classic knocks me off my feet.